Curious about what CoachRail can do for you? In our first webinar, one of our team members, Chris, will take you through the software and show you step-by-step how to make the most of our new tracking feature with the app. 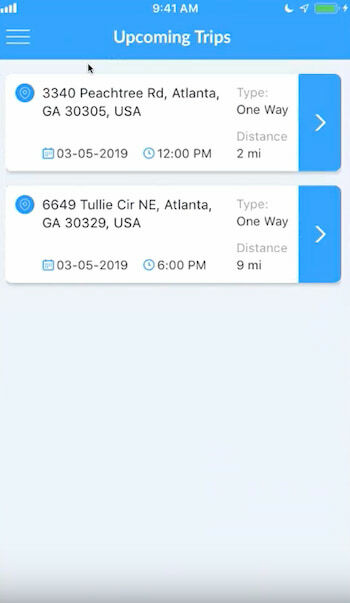 You’ll see how easy it is to store trip information, track current trips, and ensure that you’re providing the best possible experience to your passengers. Click “play” below to watch our latest webinar, or follow along with the transcript below! Okay, welcome everyone. Just to let you know, this meeting is being recorded. Appreciate you all attending. What we’re gonna go through today is the tracking side of things. We’re gonna be working through the actual CoachRail online system, and we’re also gonna go through the mobile application as well. So, I’m gonna show you from both perspectives how this is gonna benefit you as a company, your ability to oversee your fleet, and problem-solve any potential situations that may arise with regards to buses going wandering off, clients not being able to find where their selected place is, so on and so forth. So, it just kind of helps you eliminate those sort of things. So, we’ll dive right in. As you can probably see on your screen right now, this is the main CoachRail front page. So, we’ve got Quotes, Reservations, Referrals, etc. We’ve actually built out a quote earlier which we are going to dig into. So, once you’ve got something going on, you got a trip going out, you can quickly have a look over it. If you go into your “Reservations” side of things– of course we move to the “In Progress” and then you can see all your trips that are happening right now– we’re gonna jump into the “Brian Higginbotham” one and he is at the bottom here. 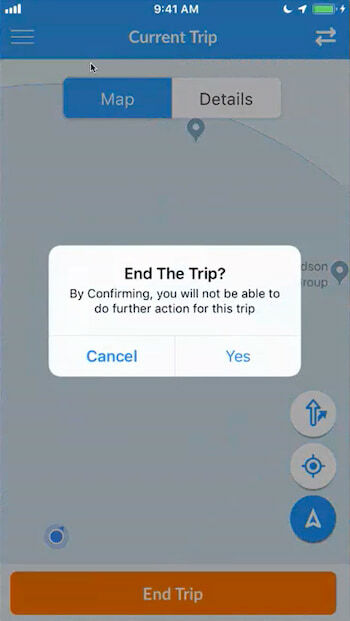 If you wanna see what is happening in your trip, just hover over the “View Details” with your mouse, click into it and then you will see the information regarding the reservation number and what is happening there, the driver, so on and so forth, addresses, and then just the description. We’re just going to Willy’s, so we have a coach ride for that today. Any internal notes [will also show up here]. Description will go on the app, and we can show you that side of things later. So the easiest way to go in here is to just go to “Show Map,” [at the top right corner of the screen] and then we hit our little refresh button, and there we can see where our bus is right now. So, this bus is not actually moving as it stands, just for the sake of the demonstration, but there we can see it. And then you can hover over with your mouse, you’ll find out that little bit of information, which reservation number it is. And then if you click on it, you will then be able to see the bus, and the route it has taken, and the route it still has yet to go. 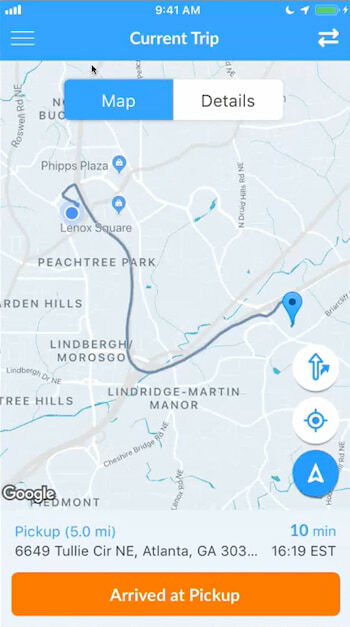 The route that it has taken is indicated by the blue line, and the final destination is the down arrow towards the top, and then it’s that grey dotted line which will continue that trip on there. Like I said, we don’t have this bus moving right now, but that’s why you can’t see it moving. That, however, would be moving throughout that side of things there. So, if you ever need to go into an individual reservation, that is how you would do it there and then you can have an oversight of that. If you’ve got multiple buses within that reservation— so, let’s say, for example, we’ve got three buses on this one here, you would be able to see all three of those buses within this [same] overview, okay? 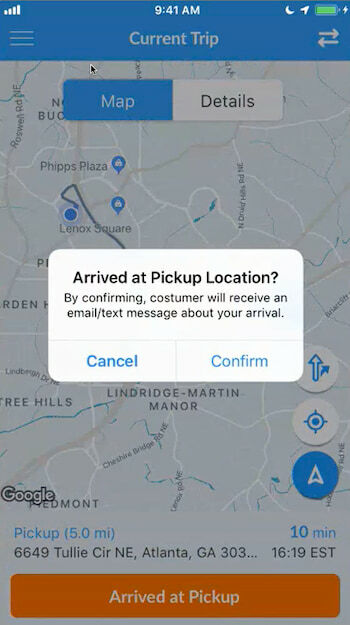 So, that is very simple, and again, the drivers would have to be using the mobile application, which we’ll go through in a short while, in order to make that happen there. So, that’s how you would be able to receive the view. So, let’s say for example, they’re trying to get somewhere else, people are meeting them, something’s late, you can just quickly jump into there. You can figure out, hey, look they’re two minutes away, it looks like they might be stuck in a wee bit of traffic. And then that gives you that nice instant customer satisfaction. So, they have their worries relieved real quick without you having to get off the phone or put them on hold, speak to your driver, call them back. And then it’s that whole back and forth with the phones— this will just completely eliminate that. But also, if you just need an oversight of what’s going on on a particular trip, you’ve got that ability as well. So, this kind of gives you an overview of each particular trip there. We’re gonna close that one back out there, so we close it all out. So, if we swing down to “Tracking” here in the bottom left-hand side of things and we click on that, again, we will see our famous little bus there that we’ve parked for now, but again, we can just kind of click on that side of things. Now, we’ve only got one bus on the road as it stands to this second. However, if you’ve got four, five, six buses on the road doing multiple different trips, you will now see all of those buses at once. So, instead of just seeing the one view for one reservation, which we just did, now you can see a full picture of everything that’s going on there [by clicking on “Tracking” in the left menu bar]. So, this just gives you the opportunity to just see how everything’s going. If one bus has taken the wrong route or anything like that, you can spot it real quick and problem-solve as need be. Or if you just want to double check, make sure everything’s running okay, this is a great thing to do. Me personally, if I was running the business, I would probably have [this] up on screen all the time, and then that way you can kind of just see what’s going on at any given moment. So, this just gives you a nice overview, that kind of peace of mind of what’s happening in your business at all times. So, that’s a little suggestion on that side of things there. But again, you’ll see those moving, blue indicates where [a bus has] come from and then the grey indicates where it still needs to go in order to complete its trip there. So now we will move on to the application side of things, so I’m now going to drag my phone onto the screen. Okay, so get on that side of things there, let me make that a little bit bigger for you all. So, […] this would be for the drivers as well. They go into their application, […] the CoachRail app. If you haven’t downloaded it yet, you can get it on the iTunes Store or Google Play. And so you’ll actually see the Peachtree Road one at the top there, that’s the one that we’ve got parked up right now. But [6649 Tullie Circle], we’re gonna run through this one here. So, if you [click] on your trip, it will give you all the information regarding that trip that your driver would need. So, this is kind of their little dispatch information, there’s the opportunity to call the customer, they just click on that. But if you need to quickly touch base with them, there you go, that’s a great opportunity to do that there. It’s got the details at the top with regard to the reservation number, and then the type of trip, and then in the description is what you put in earlier on your quotes. 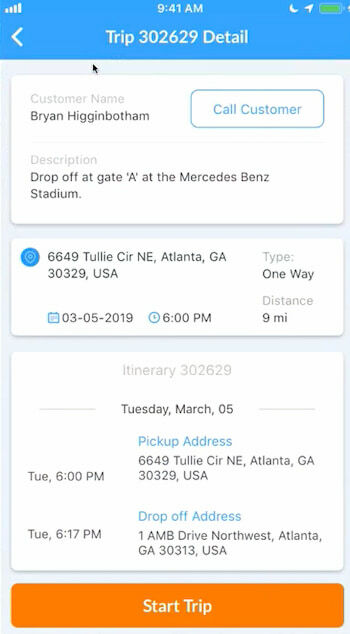 So they’re gonna get dropped off [specifically] at Gate A at the Mercedes-Benz stadium. 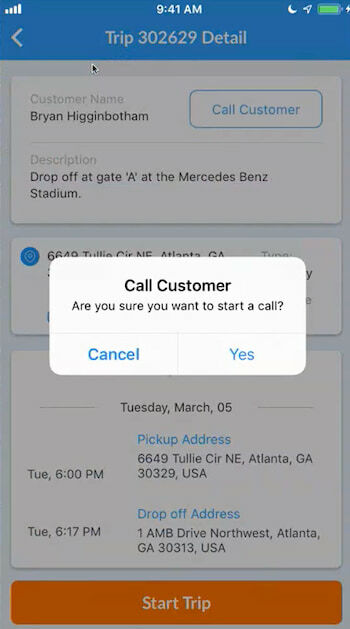 So, instead of kind of just being [at] the Mercedes-Benz, now you’ve got that little bit of an extra touch in order to help give the best client experience that you guys possibly can. So again, if we jump in and we start our trip, then it will get going there. You’ll see an overview of how to get to where you need to get to. 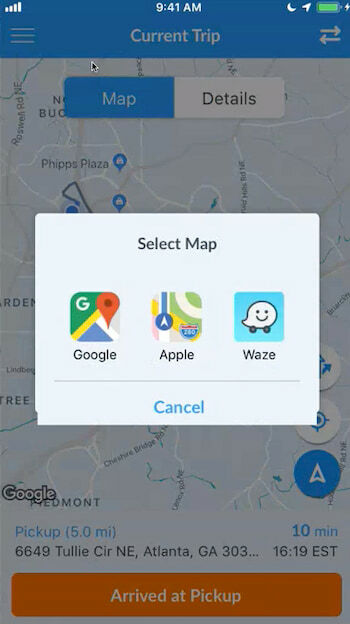 And then in order to jump in there, you press the blue arrow, and lo and behold, you’ll be offered [a map via] Google, Apple, or Waze to sort out how you’re gonna get to your trip. 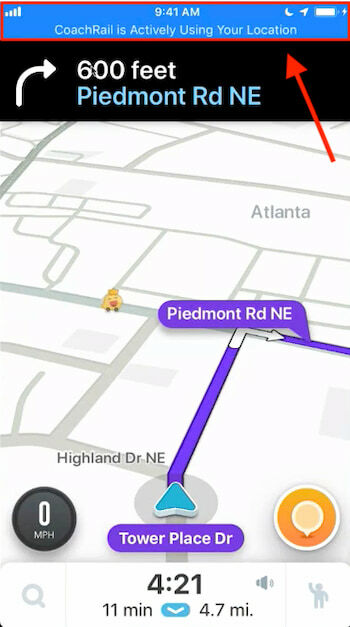 Me personally, I like Waze, so I’m gonna choose this one. So yeah, it will take you to your current destination and then it will give you your set-off to get to where you need to go to, boom, and you are ready to go. So, you’ll notice at the top it says, “CoachRail is using your location,” so this is your opportunity to make sure the trip’s been done. So, you remember the previous screen that you can see in the background here, where you can actually see where your drivers are? That’s why CoachRail is using your location there. Waze is obviously giving the directions right now. So, once you’ve [arrived at pickup], we’re just gonna assume that we’ve arrived at our destination, hopefully not in that time, otherwise that would be a lot of speeding. So, make sure your drivers are keeping to the speed limits and driving safe. So I would click on the blue flashing icon bar at the top and that will take me back into there, and I’m gonna say, “Yeah, I’ve ‘arrived at the pickup.’” And so there we go. So, they’ve got their email [alert] that we’re there and then we are gonna collect a signature. 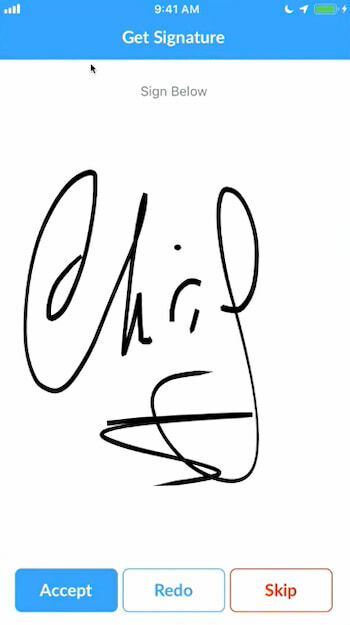 So, my name is Chris, so I’m gonna sign it “Chris.” So, yep, you collect your signature. Yeah, I’m just making it look really fancy. Accept that and there we go. We are ready to rumble with this trip. Okay, so now if there’s any situations where they’re like “Well, my driver was 20 minutes late,” and asking for refunds, things like that, now we’re going be able to provide you with documentation showing that, “No, you actually signed that you were picked up at this time, so that is false.” And then that way it’s gonna help you with chargebacks, things like that. And again, it’s all about offering that great customer experience to your clients, which is what our goal is. So, there we go and you see we’re going from Buckhead now down to downtown to the Mercedes-Benz Stadium. So, we can jump into Mercedes-Benz and it’ll take us through that route there. And then I’ve arrived at the drop-off, so I signify that, complete my trip, end the trip, and there we go. Trip is no longer on there and it will be done and dusted. It will not actually show on the overview map here, so if you’re [watching and] wondering, “Well, hold on a second, that didn’t show on the overview map,” that is because I didn’t drive anywhere. It only actually starts picking up once you’ve traveled 50 meters and then that will demonstrate to the app that the bus is moving and you’re up and running. So you see there, it hasn’t kind of spread it because someone set their app off accidentally. So, you can see we’ve got the driver going there with our parked bus, but the beauty of that is, like I said, you’re in, out, all that information is there and that would be in “Completed Trips” on “My Reservations” now. I can jump across to there, [to] “Completed Trips,” and then it will be in here somewhere if I can dig around. There we go, that was the one that we just completed to the Mercedes-Benz Stadium, there we go. And you can see the description I put in earlier that we saw on the app, like so there. So, that is pretty much it for this particular demonstration, like I said, we wanted to keep it short and sweet, and the beauty of it is it’s very simple to use. That should give you all the information that you need to know. However, feel free, if you’re unsure of anything or have any further questions, you can reach us at support@coachrail.com and we will get back to you as quick as we possibly can, usually within 24 business hours. We’ll get back to you as quick as we can, but yeah, feel free to ask us any questions on that. Also, you can speak to your account executive as well. We’ve got some of the best account executives in the business, so feel free to reach out to those gentlemen and ladies and they’ll be able to support you further with everything you need from there. I appreciate you attending today, and we look forward to continued success, and any time we bring in new features like this, we’ll be sure to give you a live demonstration like so, so then you can get acclimated to it there. But yeah, wish you all the very best for the day, wish you all the success as always, and yeah, have a lovely, lovely day. Bye. Need a personalized demo? Contact us today to learn more about how CoachRail can streamline your travel business. Our team is always happy to share more information about all that CoachRail can do for you. Call 1-844-733-4377 to schedule your demo!